Itching for warmer weather, and with the boat still needing repairs, we (just David and I, kidless) decided to head to Mexico. 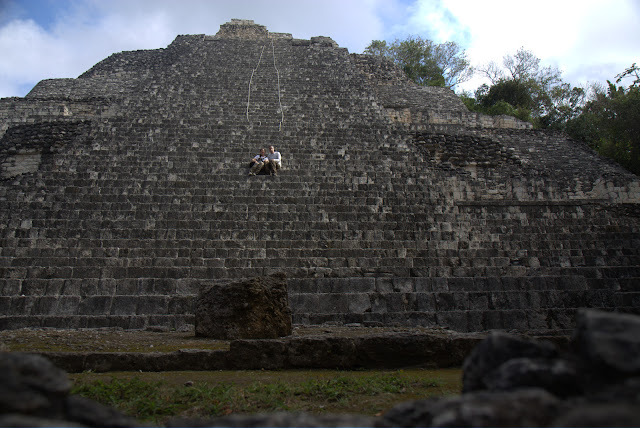 We’ve been to the Yucatan Pennisula a few times before. The water is warm and it would be a good place to pass off a Rescue diver course. We had first looked at going to the Philippines but I didn’t want to give up time to do Rescue diving there. I’ve never been there, so I’d want to see everything, not just spend the trip working on Rescue diving. And then the price and time was going up and up, so we came up with Mexico. I’ve already seen everything in the Cancun/Playa Del Carmen area, so it was a good place to go. Combine it with a few days out to the western side of the Penninsula to see some new sights and towns, and it would be a great trip. Most places to stay in the Cancun or Riviera Maya area are All Inclusive resorts. Which I guess is great if you don’t mind over paying for food, and plan to sit on the beach all day. But that’s not us. We did that the first time we came to Cancun 10 years ago. But it seems to me that the All Inclusive prices have risen a lot, and what you get hasn’t. We enjoyed the resort we stayed at 10 years ago, we spent portions of each day laying on the beach, but we also picked to go at low season, and the beaches and hotels were empty. It was a great trip. We took a few fun trips, the bus to church. Another day we rode the bus to downtown Cancun, then took a collective ( local minivan bus) to the ferry terminal, took the ferry to Isla Mujeres, a small island near Cancun, and did some golf cart exploring and snorkeling. 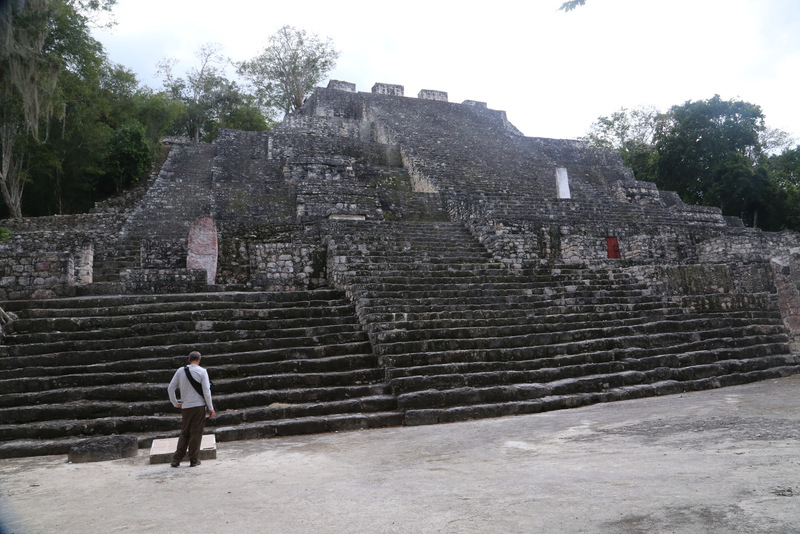 Another day we rented a car and drove the ruins route (Chichen Itza, Coba, Tulum). Great trip. Six years later we came to Cancun by boat. You can read all about that on this blog. That was an even better trip. After spending more than a month in the area, we got a good feel for it. This area is very safe, the people friendly, the food delicious. So we knew we could come and not stay in a resort, especially since we would spend most of our time diving. It’s a very affordable way to go, and very fun! It’s not the wait on me hand and foot, vacation, but a more real experience. We booked a small boutique hotel thru Expedia. There are literally hundreds of them in Playa Del Carmen. I knew we wanted to stay in the heart of Playa, so we could walk around easily for meals, and access to the dive shop. Our room was fantastic, had a nice sitting area, a beautiful bathroom, and a private out door garden shower. It was perfect! The room also came with a cooked to order breakfast each morning. The heart of Playa Del Carmen has a walking street filled with shops, and restaurants. It runs for a few miles. We stayed on this strip and with all the music and noise outside, our room inside the garden area was perfectly quiet. We parked our rental car on the street behind the hotel, where it sat safely for days. Each restaurant we ate at was delicious and reasonably priced! Water is cheap and easy to buy, our hotel had water stations where we could refill our bottles each day. The tourist strip in Playa Del Carmen is quite the mix of tourists and I believe locals. It had quite the variety of people. The majority were not speaking English. You could hear several different languages in a day. Along with the locals that would be out walking the strip with their families in the evenings. Our favorite eating spot was a few blocks away, off the tourist strip and had delicious tacos. The first night we ate there we tried 3 different tacos each. About $1usd per taco. David’s favorite is the Pescado(fish). As we walked back to the tourist strip, towards our hotel, we found a great ice cream shop, $2.50 for a good sized cup of ice cream, or 4 small scoops on a cone. My favorite flavors were thousand flowers, Nata, and Avocado. We visited the taco place a few times, and the ice cream shop a few more. We arrived at the dive shop our first full day to find out the harbor had been closed all week due to windy weather, and well large waves. We were able to take our Rescue tests, and head to a pool to pass off most of the skills. Rob, our Rescue instructor was great to work with and did a good job helping us accomplish each task. Sunday we took the day off from diving, and went to church. Half the sacrament meeting was filled with tourists, but only a few of us stuck around for classes after Sacrament. The ward is somewhat small, maybe more tourists then ward members, and I am sure they have tourist every single week, that they weren’t the most welcoming. But I still love attending church, even if I can’t understand any of it. I’m happy to guess at what they are saying and read along in the app on my phone. And I absolutely love singing in worship with them. I can sound out syllables and the tunes are always familiar. After church we changed clothes and took the ferry to Cozumel for the afternoon. We rented a scooter and drove around the island. It was a beautiful day. Monday morning our hotel prepared a takeaway brunch for us as we had an early departure. The harbor opened on Sunday, so we were booked on the speedboat to Cozumel for diving. Our guide was quite intense. Al, was once a marine. He wanted to check over all our gear multiple times, we had to maintain order, so we were “good to go”. Not our favorite dive guide. But we had 2 great dives at Cozumel. Ranked high in the list of dive spots for the Carribbean we hoped for amazing dives, but we’d say average diving for the places we have been. It was still fun and we can check it off our list of places to dive. Tuesday we met up with Rob to finish up our Rescue diving course. We had a few open water scenarios to complete. We passed of course, but what did we learn? I learned that it is difficult to give rescue breaths while swimming in open water. The likelihood that it will save a life is slim. I learned to practice sharing my air source. I practiced other safe swimming and rescue procedures I’d learned as a lifeguard many years ago. If someone in the water is struggling and not think clearly—be prepared to dive down, or they will try to drown you. I teach my kids this as swimmers. It was good to practice in all my dive gear and then how to get behind them to help inflate their buoyancy. I also learned I need to know how to safely and slowly ascend with a victim. I rocketed to the surface with David in tow. Good thing we were only in 30 feet of water. I’ll need to practice that the next time we go diving. David did a much better job when it was his turn. And I will continue to practice sharing my air source so it won’t be so foreign should I ever need to share for real. The last step of the course was learning about how to set up the oxygen tank and give oxygen. Completed that and we are now both certified Rescue Divers! We did all our diving and course thru Mexico Blue Dreams dive shop in Playa Del Carmen. They were a great shop. The owner was often around and we enjoyed chatting with him. Jean Francoise bought the shop several months ago. He moved his family to Mexico from Paris 1.5 years ago, for a better family life. He sold his business in Paris and now enjoys more time with his family. Similar to us and our mindset. Our time in Playa was up, and we were now embarking into new territory for the remainder of our trip. Our first stop was to the South. Wednesday morning we picked up our gear from the dive shop, said Adios, and headed down the road to Bacalar. Jean Francoise recommend a stop there. It is a few hours south of PDC. It is a beautiful fresh water inland lake. Clear turquoise waters. We stopped at the local water park where we paid $1.5 total for both of us to get in. They have chairs and picnic tables and docks to jump off of. For a few more dollars you could pay to use a couple of large slides. After spending 5 days in the water, we just wanted to enjoy the view, so we ate lunch at the restaurant. After spending some time looking at the menu the server said he would bring us the chickend special to share. At least we were pretty sure that’s what he said—in Spanish. We were far from English out here. There were maybe a handful of tourists, the rest of the people here were all locals. We enjoyed the beauty, and the chicken fajitas were delicious. Bacalar has the remains of a fort, most likely to protect its source of fresh water from pirates long ago. After our lunch we continued on our journey south west. We were in rural country now. Cell phone service was intermittent, only when we would pass thru towns. 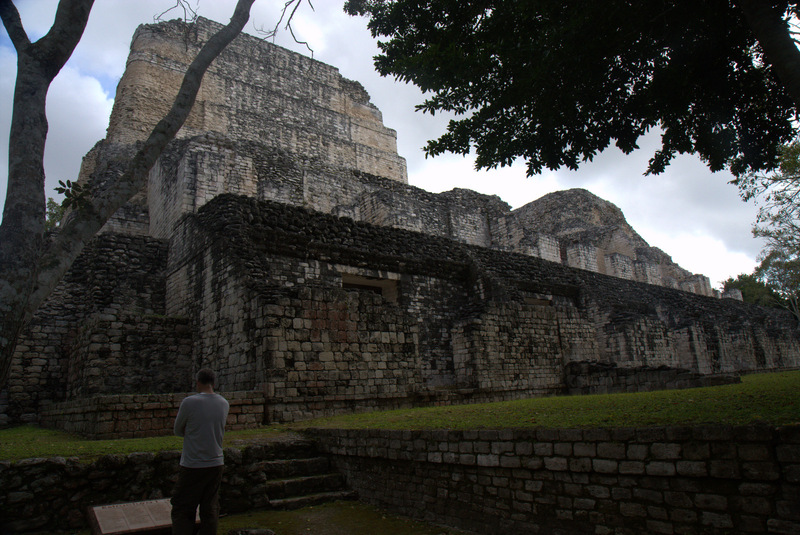 Our next stop was in Dzibanche, some rarely visited Mayan Ruins. 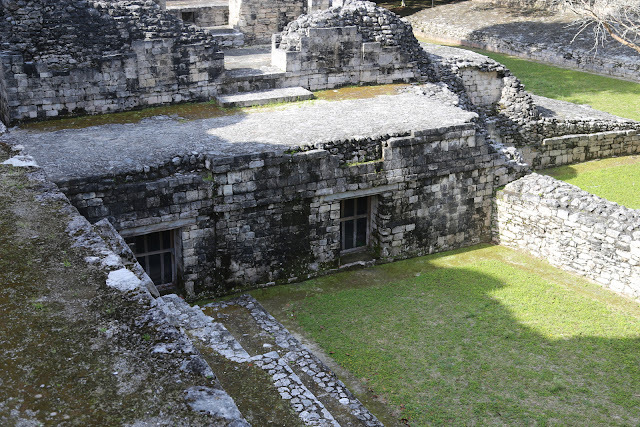 Mayan cities and towns once dotted the entire peninsula, and now we are only left with remnants of their presence. It is amazing to walk among the ruins and imagine what the towns and cities were once like. We arrived 1 hour before closing. No one else in sight. We stopped at the ticket shack a mile before the parking “field”. The sweet lady sold us 2 tickets but informed us, in Spanish, that the site would close at 5pm, we had only 1 hour. While I wish I could speak Spanish and communicate better, I am always amazed at how willing and patient people are in communicating with us. We walked around the small site. Climbed a few of them. It was peaceful and quiet. This city once was the head of government for several cities in the area. Now it is rarely ever seen, and frankly, a treat to have it all to ourselves for an hour. After leaving Dzibanche, headed down the road again, we noticed the time had changed. I was not aware we were crossing a time zone. Had we known earlier we may have tried harder to make it to Xpujil a little earlier. We missed visiting the Becan site by a few minutes. So we headed straight to our accomodations for the night, just down the road. There are not a lot of choices in this part of the Yucatan. Far from populated areas there are about 5 choices. Thru email I had prebooked us a room in the woods at Rio Bec Dreams. There are about 6 small one room cottages at this owner run place outside of the town of Xpujil. 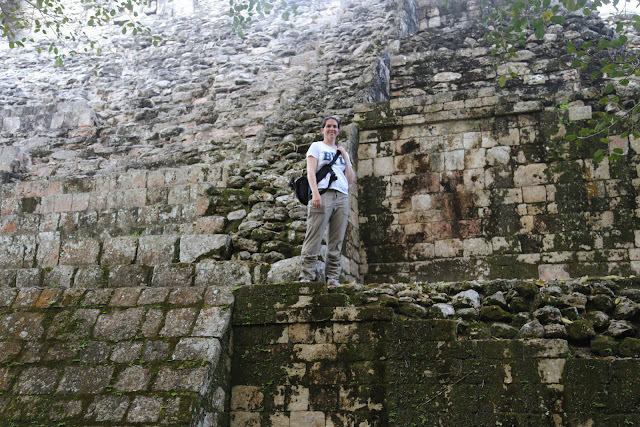 The only reason you would be out here would be to visit the Rio Bec Ruins in the area. The owners were a little unique, with a colorful vocabulary. They gave us a few handouts of tomorrows destination to help us out, which were good resources for our visit to Calakmul. They also had several books on the ruins that were interesting to read. Early in the morning they had prepared a take away breakfast and lunch for us, we picked it up and were on way. We wanted to see Becan so we back tracked the few minutes to the site, arriving before they opened. Within a couple minutes the office was open and we were walking into the site. The unique thing about this site is it’s trench, dug all the way around the city. You could access the city 7 causeways over the trench. It was 5 meters deep and 15 meters wide. It never held water, and was built specifically for defensive purposes, which they are today unsure of. They have not found that the city was at war in battle. It is not a huge city, but housed several thousand people. Walking among it’s ruins, it was easy to envision the living quarters and homes of the rich and royalty, as it is their homes that remain today. Living quarters surrounding open courtyards. We were able to walk and climb on any structure there. Enter several rooms, peak in the few that were closed off. On the side of one of the buildings, enclosed in a room with a large viewing window is a huge carving, in extremely good condition. We enjoyed visiting this site and spent more time there than we thought we would. There were maybe 6 others roaming the grounds when we left. If you’ve been to any of the sites in the Cancun area you’ll understand that the ruins in those area are flocked with tourists. The famed Chichen Itza is so crowded with thousands of tourists and over run with vendors it's hard to really connect with that site. All the buildings are roped off and only for looking. It was nice to visit these ancient cities on this trip with no one around, to quietly roam and ponder on those who once built its greatness. It turned out Becan was one of our favorite sites. Can't you picture it? Mayan's living here, sharing the courtyard, kids running around. Our next stop and the main reason we had traveled so far out here was 2 hours down the road into what is now a jungle or biosphere, Calakmul. It is a Unesco world heritage site now, but a thousand years ago it was a massive city and power among the Mayans. Calakmul was one of the big cities, along with it’s neighbor to the South, Tikal- which we visited while in Guatemala 4 years ago. 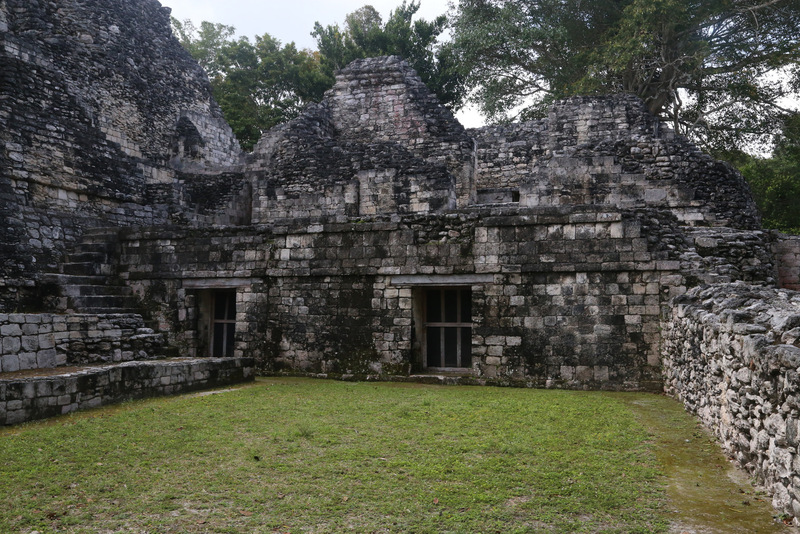 More than 60,000 people once lived in and farmed the area around Calakmul. 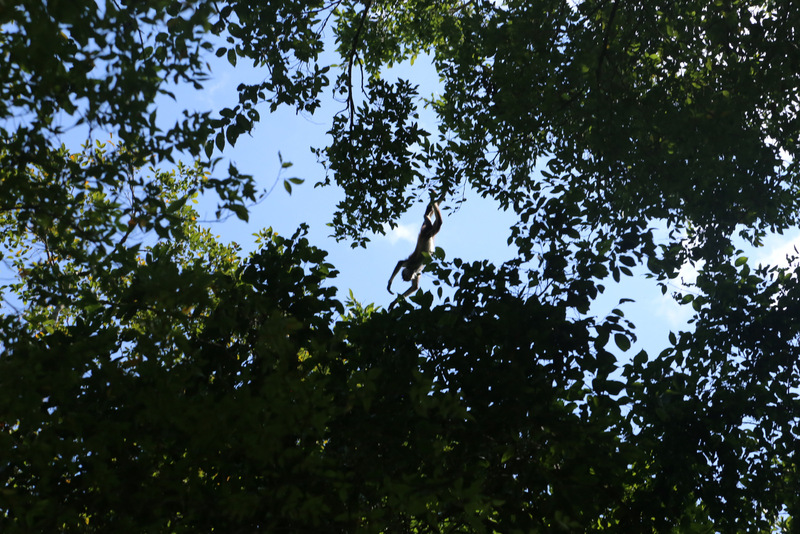 We spent 3 hours exploring Calakmul. With the information Rio Bec Dreams passed along to us, we were able to learn a little about the city and it’s buildings. We climbed 3 different large buildings and temples. Each rising more than 100 feet high. To be on top, above the trees and see the ruins peeking out of the jungle is a spectacular sight. To sit and wonder about the people who once farmed the land, and roamed the city. Within these temples, few murals have been found that tell of the people. 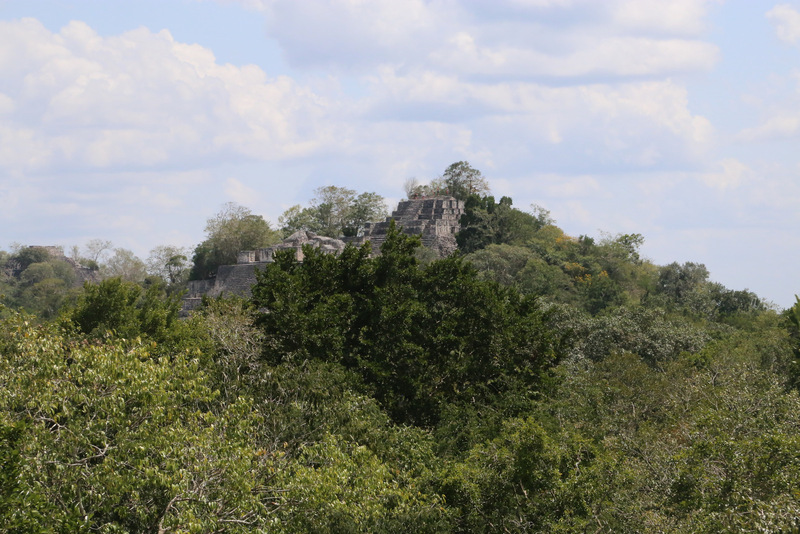 Several Stelae pillars were constructed throughout Calakmul to commemorate buildings and record significant events, but the weather and time have made it hard to determine what was once brilliantly recorded on them. Within the tombs pottery, jewelry, and jade masks have been left to tell stories. To walk on the rocky path that was once a small city road among the ruins makes us wonder what will be left behind of us in 1000 years. Not our homes, or our cars, or our “things” we collect. What of substance do we have that will last the test of time to tell our stories? Of who we are and of what we hold sacred and dear? Many of these ruins are in ruin. Piles of stones hidden beneath the earth, they were once great structures, stuccoed in bright colors and carved beautifully, now left in piles of rocks as a puzzle to figure out how they went together. If we learn from them, hopefully we’ll be able to preserve what is truly important to us. Our family histories, stories of life and love, our faith in God. After spending the afternoon sweltering in the Jungle with about a dozen other people, it was time for us to hit the road again. 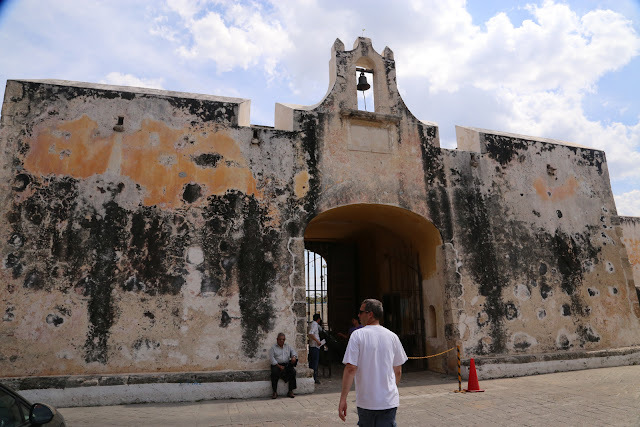 We had a 4 hour drive to our next stop—the city of Campeche. Campeche is on the west coast of the peninsula. It was once a Mayan town, until 1580 when the Spanish came and turned it into a colonial city. The old town of Campeche is still enclosed with it’s old city wall, and it is beautiful. It is easy to see why it is also a Unesco world heritage site. We had booked a room within the city walls, inside an old Hacienda. The ceilings were at last 15 feet high, the rooms beautiful. In the middle of the Hacienda is a beautiful garden courtyard that our first room looked out into. I say first room, as we moved rooms the second day. They first placed in a room with 2 double beds, and the next night moved us to a King room as I had requested in my reservation. As beautiful as the accomodations were I couldn’t believe how affordable at $50 per night. We had a short walk a few blocks away to the town square. Walking the town was beautiful. Especially in the evening. They have a short road of restaurants. As we walked down it our first night, I was wearing my BYU tshirt, and a young man working at the pizza restaurant we passed loudly said “BYU” as we walked by. We turned and with a smile he said “Brigham Young University. I am a Mormon!” We smiled and said “us too.” We asked him where the church was and he informed us he did not speak much English. No matter, the important words had already been said- I am a Mormon! I love to wear a BYU shirt as we travel, it declares who I am, and allows me to find those who know! After dinner we walked over to find dancers performing traditional Spanish dances. The next night we enjoyed the light and sound show on the wall of one of the buildings lining the square, followed by an orchestra and opera songs in the cathedral. During our stay we visited a few museums in the area, and walked and walked. We walked up a Bastion and along the top of the city wall. In the evening we enjoyed different events at the pretty town square. We even ventured outside of the old city walls and nearby found a real shopping market with hundreds of stalls of vendors selling everything. Everyday goods, clothes, shoes, fresh fruits and veggie stalls, meat stalls, fresh fish, even hanging chickens!. We could have been wandering the markets of Poland, or Thailand, I find it interesting that people all over the world shop this way—except in the US. We picked up a cheap Lightning McQueen backpack for a cute soon to be 6 year old. Saturday morning we packed and hit the road again. This would be our last destination, the city of Merida, before heading home. 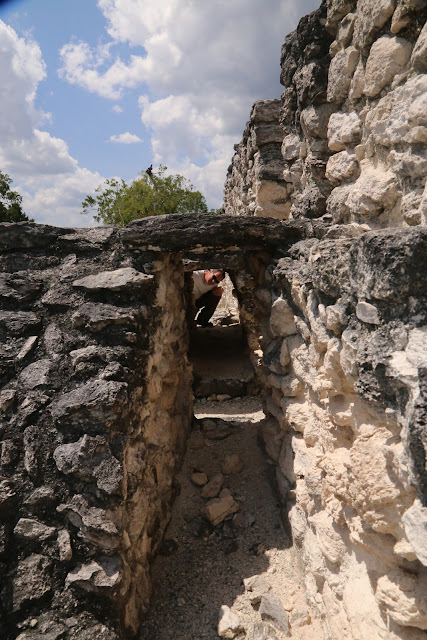 On the way to Merida we spent the morning exploring one more Unesco world heritage site (this means we have seen all these sites in the Yucatan, we highly recommend looking up Unesco sites when you travel, they make the list for a reason). 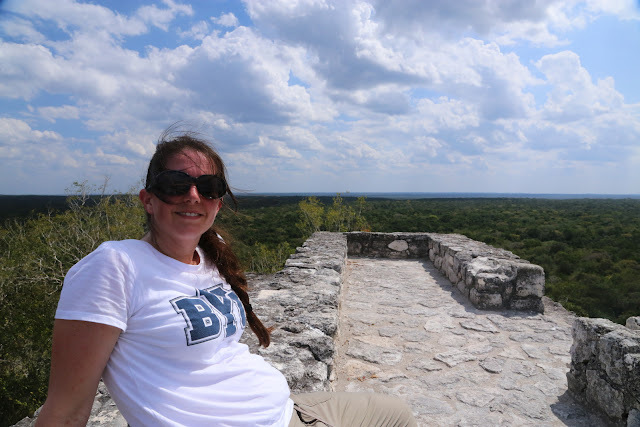 We stopped at the ruins of Uxmal. Although still aways for most tourists to visit, many do make it here. We arrived before any of the large buses make it in for the day, so it wasn’t crowded yet. The city of Uxmal was also once a fairly large city of 25,000 people. It has some beautiful restoration work. This city was incredibly carved. It is located in a very dry part of the land and oddly had no source for fresh water. 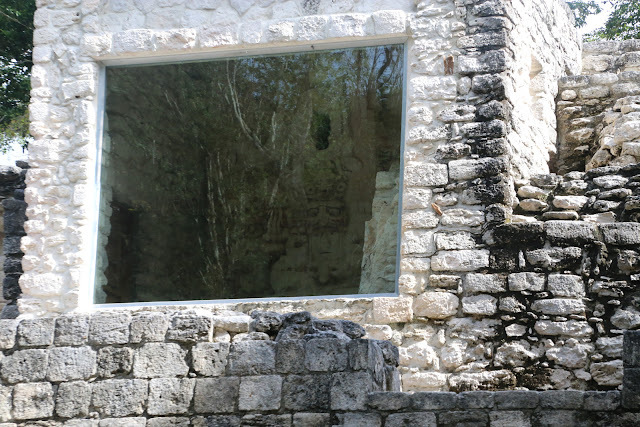 Much of the Yucatan is covered with cenotes- an underground cave system filled with fresh water. Many of the Mayan cities used these cenotes for their source of fresh water. Uxmal had none near it. All water came from rain. 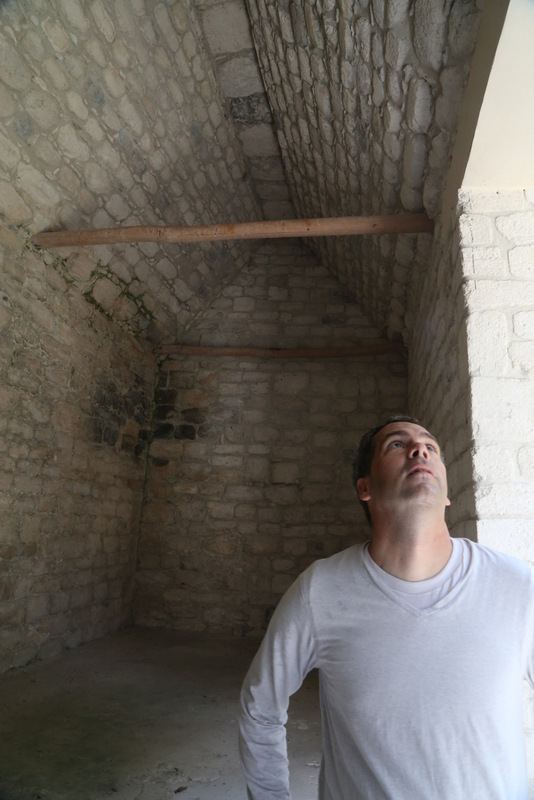 So they built cisterns to capture and store water. And they greatly worshipped Chaac the rain guide. They decorated their building with many many intricate carvings of Chaac. Much of the areas around the sites have been cleared of the jungle giving a better representation of what the squares would have looked like back when… of course they probably would have been filled with vendors. You can still climb and wander most structures at Uxmal, except the largest tower- the Temple of the Magician. This Temple is quite steep anyway. It has a legend. The Mayan legend they tell is a young man was going to be put to the death, and the King said he would spare his life and turn over the throne to him if he could build a temple by morning. As the sun rose the next morning, the Temple had been built. The young man’s life was spared and the throne relinquished to him. And that is why they call it the Temple of the Magician. We left Uxmal, hot and sweaty and drove into Merida, only an hour away. We decided to stop at Le Gran Musee of Anthropolgy before checking into our hotel. 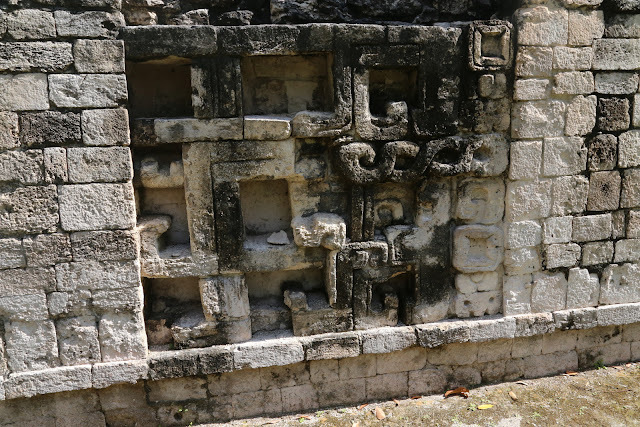 Here they had a lot of artifacts from many of the Mayan sites in the Peninsula. It was a great museum and worth the time and fee to see the pottery items, tools, jewelry, burial masks kept preserved here from the many ruins. I sort of wish they kept some of these items at the ruins as it helps to bring to life the people that once lived there. We then had a quick lunch at the nearby Costco. Always fun to visit a Costco in another country. I highly recommend it! We arrived at our hotel looking a little shabby after a long day of exploring. Our hotel was in the old city part of town, and as in Campeche, we parked the car on a side street, then walked around to the front of the hotel. We’d left our bags in the car, first wanting to see if parking was provide somewhere, like an inner courtyard. We walked to the front to find a gate, that was locked with a pad lock. A young man popped up from his post that is somewhat hidden from where we were standing. We asked if the hotel was open?, gesturing at the lock. I should mention here, that for our last 2 nights I had “splurged” on a room in a high end boutique hotel, also in an old Hacienda. (it wasn’t super pricy by US standards, but for Mexico prices) I am sure the young man took one look at us and figured we didn’t belong. He said "one moment", and then radio’d inside for reinforcements. Another gentleman came out of the hotel. I said we were here to check in. He asked my name, and once I told him, he responded that my reservation was for tomorrow night. I pulled out my phone and pulled up my reservation to double check, but I was right, reservation was for tonight staying for 2 nights. And he then said come inside. And they unlocked the gate. I got the impression, we had passed the test. I then wondered if they were locking us in and now we could never escape! We followed him inside to the reception office, where he apologized and grabbed our paperwork for our reservation, which they had ready and waiting on the side desk. I really think we did not look the part and we had no bags with us, so he was “testing” us. Or maybe he didn’t want to let us in—he didn’t like our “look’? It was a very interesting experience. And I was having a flash back to our night in Kuala Lumpur Malaysia where we were turned away from the fine restaurant because they didn’t like my shoes! There was still a little afternoon left so we went for a drive. We drove around the old city first, the sidewalks filled around the city square with what appeared to be the a garage sale type market. 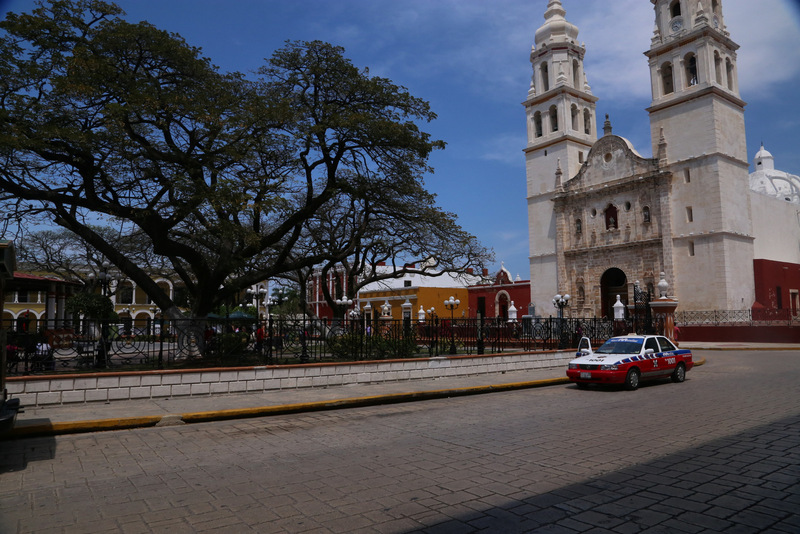 Merida is much larger than Campeche and there were lots of people everywhere, shopping, walking around. We found the best place in the city—The Temple. Within the city center, but almost hidden from it’s surroundings, you can barely see it from the street. You may not know it’s there, if you weren’t looking for it. The beautiful Merida Temple. From here we went back to the hotel to see if we could come back in. We had our bags this time and left the car with the valet (or guard) to park it. We showered and changed to some much nicer (acceptable) clothes, then asked if they would make us a dinner reservation somewhere good. Fine dining in Merida only ran us about $50 total for the both of us. That include an appetizer to share and 2 deserts. You can see why many expats come to Mexico to retire or just live more affordably. The food was delicious, a fusion sort of restaurant. Our appetizer looked like charcoal briquettes. They were delicious briquettes! And my desert was a salad—with greens. Very interesting stuff. In the morning we headed off to an 11am ward at a building near the Temple. But the church building was boarded up. The church’s site says 2 wards meet there. But we couldn’t figure it out. So we plugged in the address for another ward meeting across town also at 11. We’d be just a little late. Except the map app did not take us to the same place on the church’s site. So we dropped a pin where it was on the church’s site, different neighborhood maybe, not too far, but now we’ll be even later. We found it and arrived in time to catch the last half of Sacrament meeting. It may have been a branch as there weren’t very many members, but they were far more welcoming than the ward we attended last week. No one spoke English, but they welcomed us wholeheartedly and tried their best to communicate with us. After Sunday School a few sisters invited me to follow them to RS. After church I told David, I really wish I spoke Spanish—I missed out on a great meeting! It was on the Atonement, I was reading the lesson on my phone, and my past experiences in attending church in Mexico had me thinking there would be sweet sharing of testimonies and love of the gospel, maybe some tears. Everytime we attend church in Mexico, while I don’t speak the language I can always feel the great love the members have for the gospel (even the ward we attended last week, you could tell the Gospel Doctrine teacher enjoyed teaching the gospel). The sweet sister sitting next to me would point out where they were in her manual. At some point early in the lesson, this sister started talking adamantly with the teacher. They went back and forth. I was trying to decide if the sister next to me had it wrong, or if the teacher had it wrong, as they kept going back and forth, and the teacher seemed to be saying “let me speak” but then a sister on the other side piped in, and she seemed to be agreeing wholeheartedly with the sister sitting next to me. And they were all talking back and forth. Their was no yelling or raised voices, but definitely adamant discussing. The bishop stepped in the back of the room, and after listening for a few minutes, asked the sister next to me which lesson it was, and she showed him. Then the RS president spoke up and commented, and then they were all going back and forth. There were only about 10 of us in there total. After a few more minutes, the bishop went and sat in the front of the room off to the side. He made a short comment and then I believe the RS president said let’s move on, because the teacher turned a few pages in the lesson book and somewhat stiffly spoke the rest of the time. They had spent at least half the time on whatever heated discussion they were having. When she was done she came and sat in the back. The bishop then got up and said something, but didn’t take long. And then RS president stood up and held up the lesson and said it was lesson #6, and “mui importante”. I believe encouraging everyone to read it. Mui importante. Everyonce in awhile during the lesson the sister next to me, would put her arm around me and squeeze my shoulder or touch my hair and say something in Spanish, then she would smile and put her hand over her heart and then gesture to mine. She was so sweet and I believe suggesting that while we don’t speak the same language we communicate through the Spirit, and it touches both our hearts. I truly believe this and always feel the spirit no matter where we are in the world when we attend church. The spirit truly touches our hearts and testifies of truth even when it is in another language. The sister that taught the lesson snuck out the back door and was waiting outside for her grandchildren. She seemed a little upset. I really wish I knew what had happened! I need to learn Spanish! Or when is google translate going to work so well I can just turn it on and it will translate into my ear bud. That would be awesome right! I did watch the Bishop approach this sweet sister and shake her hand, exchange words with her, and smile at her. I could see in his eyes his sincere concern for her. David said Priesthood was not nearly as exciting. They had a different lesson on magnifying callings. He knew that because the brother that sat next to him spoke some English and so did the teacher. Lucky him! They even included him by asking what his calling was. He said boy scouts—do they even have the scouting program in Mexico? I am not sure. Our breakfast table, just outside our room in the beautiful courtyard. Breakfast was included with our room, and it was a treat to sit in the courtyard with the peace and beauty. It started raining lightly after church, so we spent the afternoon driving around the city seeing the old and the new. 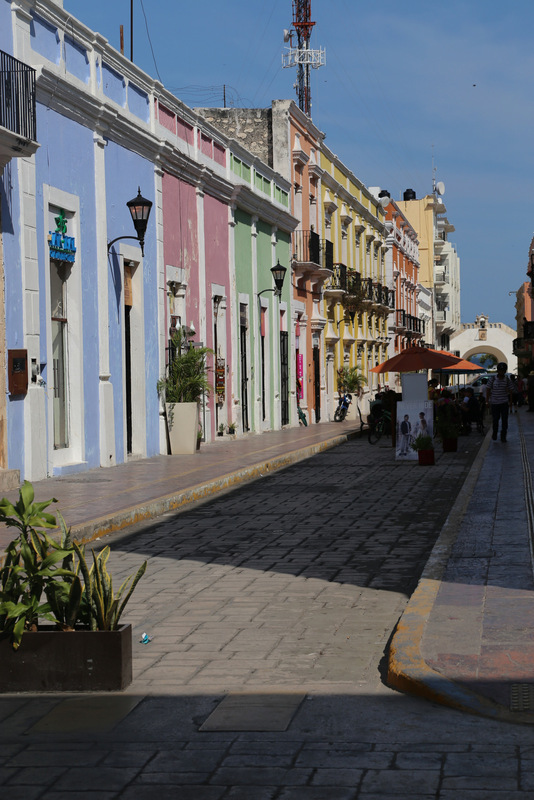 Almost 1 million people live in Merida. So it's a good sized city with lots to see. We enjoyed our time there. Monday morning we were packed and on the road just after breakfast. We had a 4 hour drive back to Cancun where we would fly home from that afternoon.